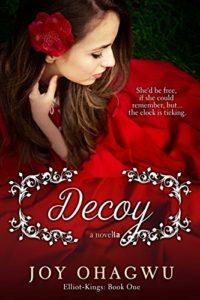 Decoy by Joy Ohagwu is a Christian murder mystery and try as I might, I could not guess the outcome! It is the first book in the Elliot Kings series. Prayer is not just for times of crisis. We should pray at all times. “She sent a prayer of gratitude to God.” Prayer is just talking to God. It is part of being in a relationship with God. Within the novel there is much fear. Fear can imprison us and stop us moving forwards. “What held you back was the fear in your mind.” Our mind is powerful in convincing us of things. Fear is the opposite of faith. When fear invades us, we need to run to God. The presence of God in our lives is key. “All she had in life now was her and Jesus.” If Jesus is all you have, you have all you need. The novel shows how we can sometimes transfer our human attributes to God. “Maybe God was punishing her for her past mistakes.” God will never punish us. He loves us. He will however gently correct us as He convicts us of our wrong doing. When we repent and ask for forgiveness, He forgives us and loves us and remembers our sins no more. Decoy is perfect for an afternoon’s read. It will have you guessing the outcome and leave you looking forward to the second book in the series.